We serve a local and online client base seeking high-quality guidons custom framed, and guidons framed in popular pre-designed styles. Our website is named “Framed Guidons” because we quickly discovered a need to provide quality picture framing for our military customers. 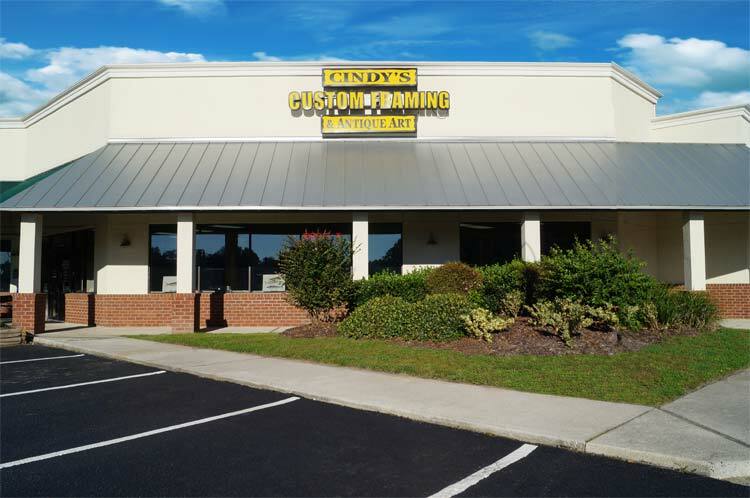 Although our domain name and website is titled “Framed Guidons” the name of our business is Cindy’s Custom Framing and Antique Art, Inc. “Framed Guidons” is synonymous with Cindy’s Custom Framing & Antique Art and with high quality picture framing. We grew by serving local military customers. The website “Framed Guidons” developed since our inception in 2006. Initially, our main website www.cindysantiqueart.com served a diverse mix of e-commerce products and picture framing services. However, as the online military guidon framing business grew, we soon realized that we needed an online presence that catered exclusively to selling and framing guidons. At the core of our framed guidon operation is our desire to provide quality framing that achieves the highest standards in conservation framing, coupled with unique design patterns. Although this site offers a number of similar guidon designs that appear to be “cookie cutter” in nature, these designs offer simplicity for customer purchase selection. The designs in the e-commerce store illustrate “basic guidon framing packages.” We show these because many people require visualization of different frame and design combinations in order to make their choice. Cindy designs a custom guidon for a client using a computerized mat cutter program. In many cases, the standard framing design options on “Framed Guidons” are completely acceptable. In other cases, customers request us to modify these basic designs in favor of more elaborate guidon presentations. Many of our customers have dedicated more than thirty years of their life to military service, and they wish to proudly display a guidon with additional mementos that reflect their exemplary military career. We accomplish this by providing additional openings in the mats, with more elaborate designs than the standard packages offered in the e-commerce store. Framed Guidons will ship anywhere in the lower 48 States–with free shipping. We insure all shipments, and we require a signature confirmation at the destination. Upon special request, we will ship for an additional fee outside the US, provided the shipment is insured and a signature can be obtained at the destination. 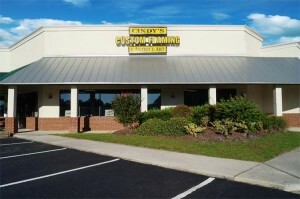 Walk-in traffic from Hinesville, Fort Stewart, Richmond Hill, Savannah, and Hunter Army Air Field has been the mainstay of our business. Our framed guidons are of heirloom quality! Every framed guidon that leaves our shop is guaranteed to have been framed using conservation framing methods that will prolong the life of the framed art, framed military shadow boxes, and framed guidons. Elena checks for exact placement of the guidon and objects. Every framed guidon is a separate project that undergoes stringent quality checks. We are not a big box, discount picture framing facility. Each guidon framing project is framed individually. Production time and care are allocated to each project to ensure the highest level of quality. For instance, all flags and guidons are sewn onto an acid-free mat. Over the years, we have repaired pieces framed cheaply by competing picture frame shops. In many instances, we have re-mounted flags that fell after heat destroyed the adhesive properties of the tape used to mount competitors’ guidons inside their frame. 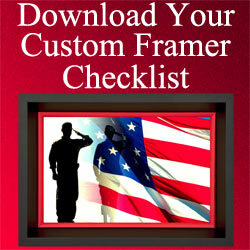 Normal turnaround time is 3 weeks for guidon framing. The guidon is embroidered, mounted, framed with all items and shipped within that time. We do not sell guidons unless they are used in our framing designs. We do not sell double-sided or regulation guidons. 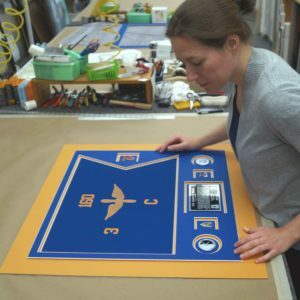 Our guidons are embroidered on cotton and or nylon blended fabric for framing in our shop. The price of our guidons is included in the framing design packages offered on the e-commerce store. If you desire one of our guidons for use in a custom frame design not featured in the e-commerce store, contact us to discuss pricing options. 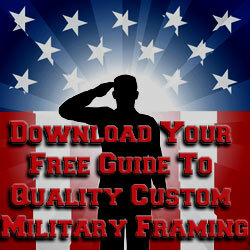 If you wish to furnish a guidon, for a custom framing project, contact us to discuss designs and pricing options. If you wish to furnish your guidon for use in one of the e-commerce designs, we will issue you a coupon code to be used at checkout. We believe a framed guidon should reflect the soldier, the sailor, the marine, or the airman’s career. 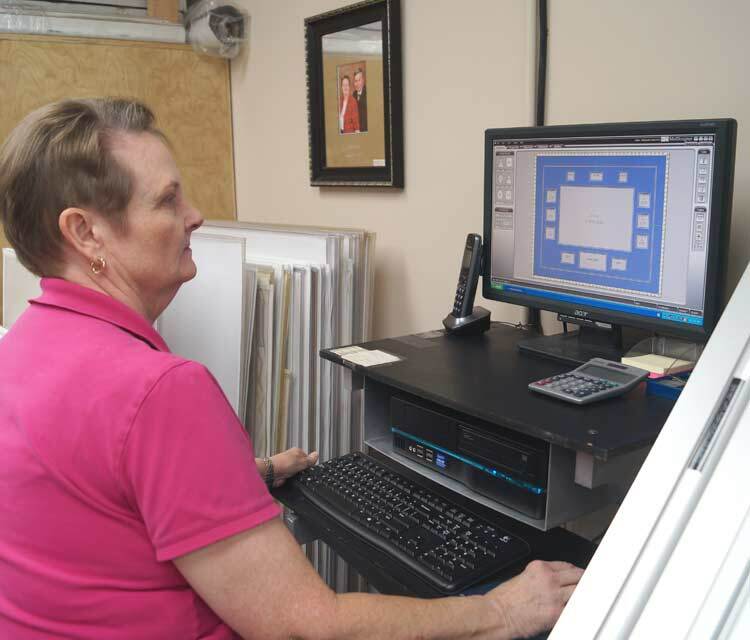 In our shop, we believe our completed framing project should provide our customer with immeasurable pride. Furthermore, we believe you should have the opportunity to pass on the memorabilia that represents your achievements to future generations. At Framed Guidons, our mission is to make you look good by providing the highest quality framed guidons. We incorporate designs that enhance the guidon in a dignified and meaningful manner, while using the best materials possible to ensure the longevity of your framed project. Internet orders are processed and reviewed during our normal business hours.